have you seen our great range of Giftware? See our superb range of Homeware, from Coffee machines to Cheeseboards and Vases. Click here to view a small selection, all of which make great gifts! Cottage Delights Cheeseboard selection, which is a lovely wood Cheeseboard, Cheese Knife and Ovel Alberts; click the image above for more information. Our Brie Bakers continue to see strongly. Great for entertaining, pop one of our Bries inside, dribble with wine and garlic slithers (optional) and bake in the dish. 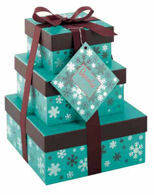 We have a superb selection of chocolates; click here to view. superb Mendip Moments Ice Creams, now available for you to reserve and collect. Having won awards for several flavours in the range, and regardless of the weather, dont miss these great flavours. One of my favorites is the Amaretto, although Clotted Cream with Honeycomb is also highly acclaimed!. click here to learn about Mendip Moments at The Cheese and Wine Shop, and just in time for Christmas, Mendip Moments introduce two new flavours! Somerset Cider Brandy.... Its delicious and is very poular here at The Cheese and Wine Shop. For something with a little more spirit, try one of their super Cider Brandys, perfect for After Dinner! Buy Somerset Cider Brandys 5 Year for next day delivery! Looking for housewarming, wedding gifts etc. See our selection of service platters; they are great for pre-dinner nibbles, or for fruits for a fondue! We have a great range of delicious Air Dry Hams, along with Pates. Please some of see our range here. do have a look at our Diary of food and wine events;it may help you to plan your entertaining with a relevant theme, or to plan that holiday!